A Caribbean-American Congresswoman is calling for a statue of the US’ first black congresswoman to be erected in the United States Capitol. Brooklyn Congresswoman Yvette Clarke, who now serves in the seat Caribbean-roots lawmaker Shirley Chisholm first occupied, has introduced H.R.4856, “to direct the Joint Committee on the Library to obtain a statue of” Chisholm for placement in the Capitol. The bill was introduced in the House on January 19th and has since been referred to the House Committee on House Administration. It has so far garnered 56 co-sponsors, including Caribbean-born Congressman Rep. Adriano Espaillat and Florida Representatives Frederica Wilson and Alcee Hastings. Chisholm, born Shirley Anita St. Hill in Brooklyn in 1924, is of both Guyanese and Bajan heritage. She became involved in politics while running a child care center. In 1965 she was elected as a Democratic member of the New York State Assembly and in August 1968, was elected as the Democratic National Committee-woman from New York State. 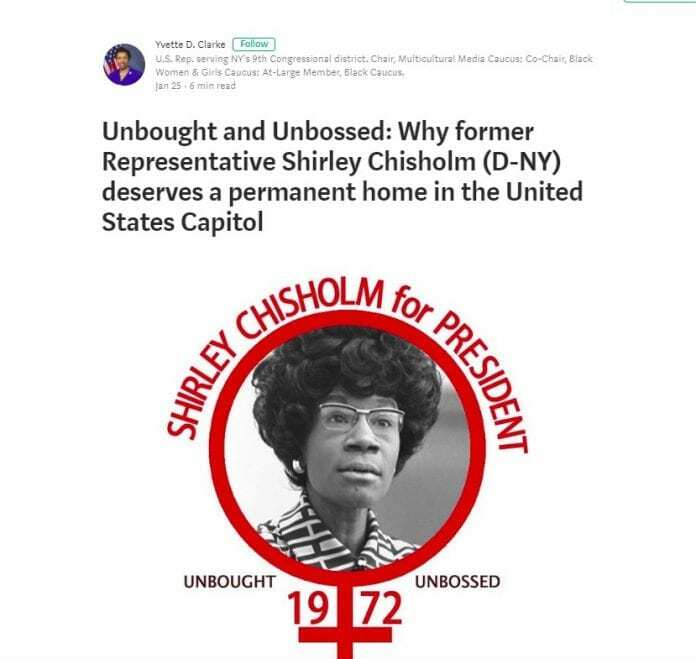 From Congress, Chisholm began exploring her candidacy for President in July 1971, and formally announced her presidential bid on January 25, 1972 in a Baptist church in her district in Brooklyn. She went on to become the first black major-party candidate to run for President of the United States, in the 1972 U.S. presidential election, making her also the first woman ever to run for the Democratic Party’s presidential nomination. After a failed bid, she returned to Congress before retiring in 1981. Chisholm died on January 1, 2005, in Ormond Beach, Florida, near Daytona Beach, after suffering several strokes.